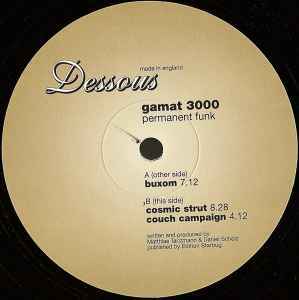 Matthias Tanzmann, founder of the Moonharbour label, and his partner in crime Daniel Scholz, team up for the first time as Gamat 3000 and deliver an absolutely brilliant release on what would soon became their second home, Dessous Recordings. Kicking things off is the aptly titled "Buxom", a rambunctious and plump affair with some serious disco groove written all over it. On the flip side, "Cosmic Strut" continues in similar yet a bit more relaxed pace however it's the "Couch Campaign" that's the clear winner here, a mesmerising stroll through broken beats, subtle keys and some effects scattered on the side. As far as Dessous 008 goes, the funk indeed is permanent.